Hand-painted cow - Black & White - Individually coloured. Picture for illustration purposes only - all cows are different. 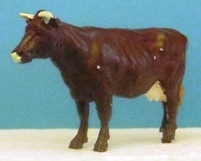 Hand-painted cow - Deep redish-brown - Individually coloured. Picture for illustration purposes only - all sheep are different.